There are a few different ways to repost videos and photos on Instagram, so let's explore a couple of the most common and popular to see which is going to work for you. Designed for iOS, this app is one of the best out there. It doesn't require any separate log in to be done, and is free, with minimal ads to interfere with the usability. It also doesn't watermark your repost, which is a big plus when you're not keen to advertise someone else's product for free. For the Android user, this is a great alternative which allows you to repost videos/photos on Instagram. It doesn't have a huge amount of features, but that does make it super simple to learn to use, so is great for the first time reposter. It does watermark the photo, however, and although free to download, requires payment to unlock the advanced features. 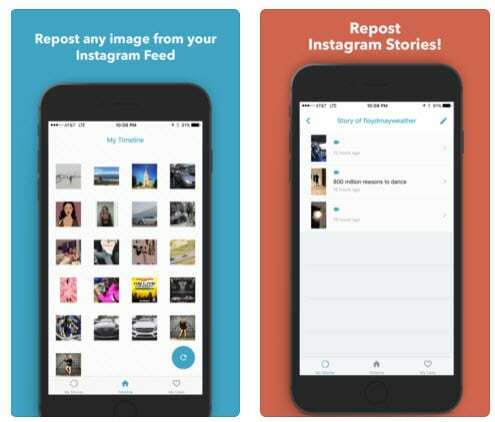 Another app designed for iOS users to repost Instagram content, this one makes it super simple to not only repost but also to save that content onto your device. However, although it purports to be free, you'll need to shell out a few bucks to unlock even the most basic of features. However, if you don't mind paying, this is a solid choice that works with stories as well as video and photo content. 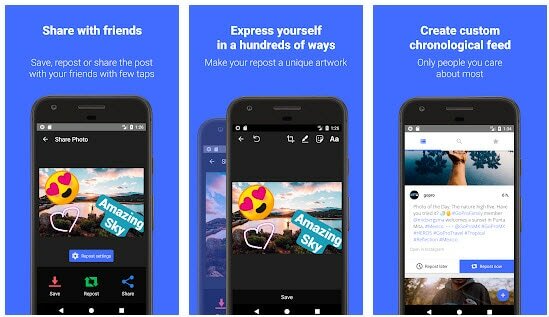 Repost for Instagram – Regrann: This pick is a cross platform app to repost videos/photos on Instagram from both iOS and Android devices. It makes it easy to not only repost Instagram content, but also to credit the original owner in an unobtrusive manner. It works right from the Instagram app, so no need to leave the Insta-ecosystem to use it. 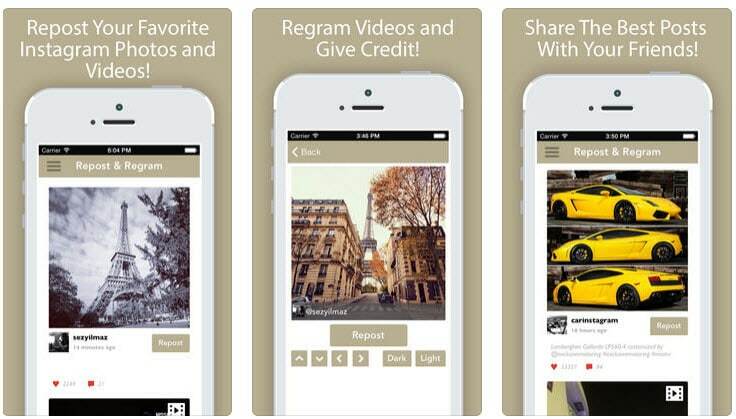 Free on both Android and iOS, this is by far the smoothest app to repost Instagram video content. Photos are possible too, and from within the app you are able to search by user, likes or even hashtags. It allows you to schedule your reposts too, although, like many others, the apps name is unfortunately watermarked on your reposted content. There are numerous other options for Instagram repost apps, each with its own set of pros and cons, so have a scout around and see what you can discover that suits your individual needs. It's not an elegant solution, but it works, and we can all do it, no matter what device we're using. Screenshotting can be done via a variety of methods depending on your device. Samsungs, for instance, often accept a swipe of the side of the hand across the screen, whereas iPhones prefer a simultaneous press of the power and home button. The image on your screen will be stored to your camera roll. 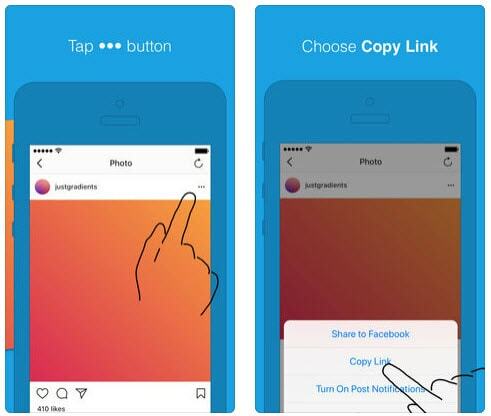 To use this functionality to repost Instagram shots, simply navigate to the content you want to share, tap it to make it full screen, then screenshot it. You may need to crop it in your photo editor, or with some phones you'll be able to upload it just as it is. 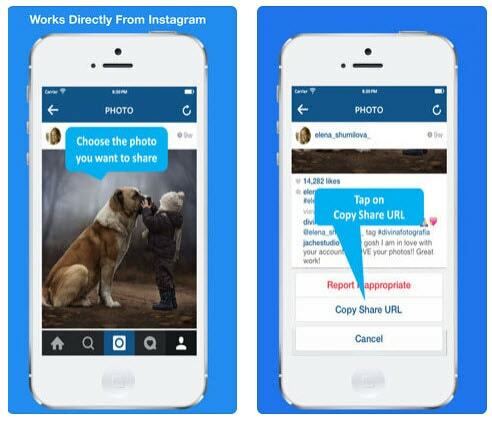 Now all you need to do is to upload it to your own Instagram account and you're done. Screenshotting is pretty low on the copyright maintenance scale, so be sure to credit the original poster in your regram, otherwise you could land up in hot water. To repost videos/photos on Instagram to other social networks is really easy, and is slightly more acceptable with ‘grammers, as it can get them more traffic. To do it, click the three grey dots at the top of the post and copy the URL to your device's clipboard. To share it on Facebook, Twitter or anywhere else, just paste the link into your post. If someone clicks on your reposted content, they will be taken to the original posters Instagram account. This can drive extra followers to their feed, so most posters don't mid this method as much as screenshotting. However, it still makes sense to obtain permission, and to credit that person when you make your regram. Seek permission, give credit where credit's due, and enjoy being able to repost Instagram content without infringing anyone's rights. Apps listed above do the work beautifully and there are some more apps of the sort. The App I use frequently is - https://goo.gl/eLYRN5 - always works for me. It is paid, doesn't have ads to interfere and works seamlessly, fast and automatically with minimal need for user intervention.